The industry produced a total 17,097,096 vehicles including passenger vehicles, commercial vehicles, three wheelers, two wheelers and quadricycle in April-October 2017 as against 15,811,071 in April-October 2016, registering a growth of 8.13 percent over the same period last year. The sale of Passenger Vehicles grew by 7.67 percent in April-October 2017 over the same period last year. Within the Passenger Vehicles, Passenger Cars, Utility Vehicle and Vans grew by 4.72 percent, 16.95 percent and 2.86 percent respectively in April-October 2017 over the same period last year. The overall Commercial Vehicles segment grew by 6.04 percent in April-October 2017 as compared to the same period last year. Medium & Heavy Commercial Vehicles (M&HCVs) declined by (-) 5.38 percent, however, Light Commercial Vehicles grew by 13.97 percent in April-October 2017 over the same period last year. 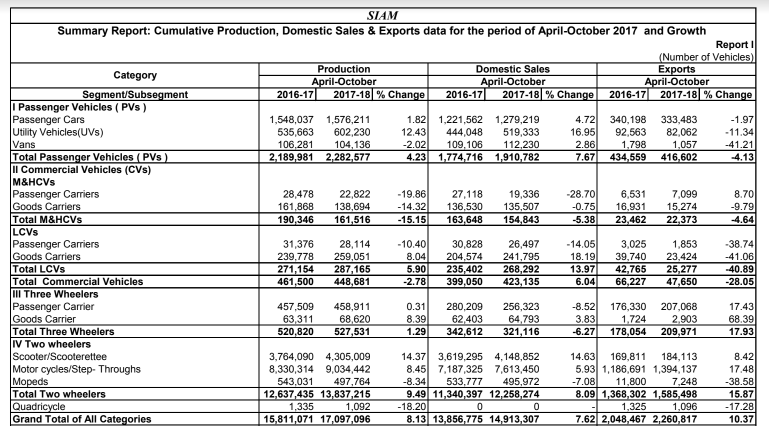 Three Wheelers sales declined by (-) 6.27 percent in April-October 2017 over the same period last year. Within the Three Wheelers, Passenger Carrier sales registered a de-growth of (-) 8.52 percent, however, Goods Carrier grew by 3.83 percent in April-October 2017 over April-October 2016. Two Wheelers sales registered a growth at 8.09 percent in April-October 2017 over April-October 2016. Within the Two Wheelers segment, Scooters and Motorcycles grew by 14.63 percent and 5.93 percent respectively, while Mopeds declined by (-) 7.08 percent in April-October 2017 over April-October 2016. 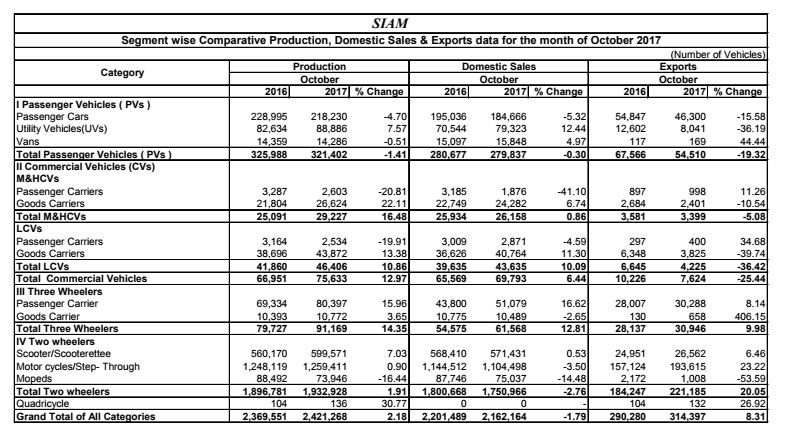 In April-October 2017, overall automobile exports grew by 10.37 percent. Two and Three-Wheeler Segments registered a growth of 15.87 percent, and 17.93 percent respectively while Passenger Vehicles and Commercial Vehicles declined by (-) 4.13 percent and (-) 28.05 percent respectively in April-October 2017 over the same period last year.